Divines of the East is a game that looks like it would be a joy to play. The visual aesthetic is their main selling point and you wouldn’t be at fault if you tried the game simply based on that. But is the game underneath worth your time? Let’s see what Ngames’s browser based MMO is all about. The art is the strongest part of this game. Blending colors and sweeping brush strokes convey a pleasing stage to play in. Characters are drawn with little details that are fun to spot but don’t distract. Backgrounds are designed with more muted colors, and are layered to give the sense of distance as your characters travel. Being a sprite-based game, there isn’t anything technically impressive to note, and the animations are repetitive and quite short, but the art style can make it a little easier to forgive these shortcomings. The music is also good. The gentle twang of lutes, along with the slow rise and fall of flutes and horns, match the Asian motif of the visuals. There is a variety that comes from this ensemble, from the staccato pace of a quiet number to the rousing score that is often attached to huge towns and dungeons. There are a few complaints that can be leveled against their sound design, however. Music is played back at a low bit rate, giving the otherwise good soundtrack a muffled quality to it. Also, pieces are short enough to notice that they are on an incessant loop. Thankfully, there is an option to shut off the music, but that makes the other flaw in the audio presentation more noticeable – the lack of sound effects. The only time you’ll hear any sort of bang, fwip, and slash is during combat. They’re middling at best. And there’s not much to hear as you walk about town or explore the wilderness – no subtle footsteps, incoherent vocal babble, or ambient noise. Turn off that music, and you’ll be sitting in silence. Divines of the East has plenty of activities for your chosen character class, whether it be the Swordsmen, Eidolon, or Leaf Elf. There are story based quests that reward quite a bit of xp. 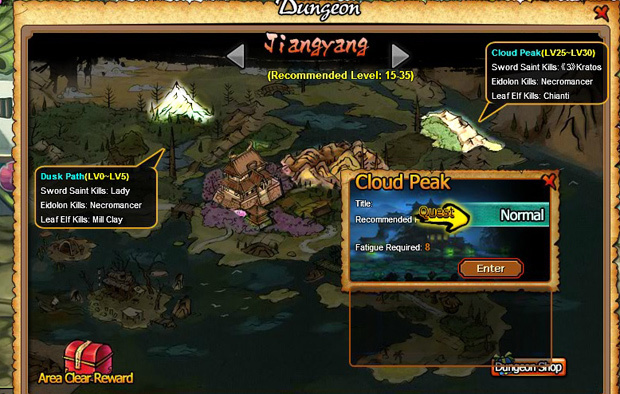 There are also dungeons that you can take on with other players, when you are at a high enough level. Also present are faction based events that are available at certain times. You may find more things to do if you check out the game’s events calendar. 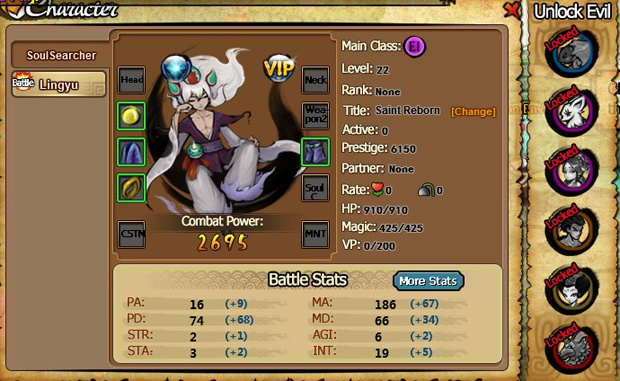 To progress through the game without knowing the UI and how things work. To expose you to some of the more nuanced mechanics that is hidden under that confusing UI. It’s good that this feature exists, because it prevents you from feeling stuck when you are just starting out. However, the downside to this mechanic is that it’s a fairly hands-off experience. When the game shows you to a new feature, it points out the buttons that you need to press, without explaining what each button does. This may be frustrating to those who need additional explanation in order to know what they’re doing. But, at least for a good chunk of the game, it’s just push-button operation, so there’s not much need to understand – just click a link and watch the game go. Divines of the East has many parts of its gameplay that are automatic. When you click on a quest link in the Task Track, your character will move to the next quest giver, then to the monster you need to kill, and then back to the quest giver for your reward without much input from you – except when you need to click on stuff to move past dialog windows. There is an auto-complete button for dungeons that will move your character through the area, fight all the trash mobs, AND kill the boss for you. You still watch your character move and fight, though, which makes the process feel like you’re botting. And the reason why the auto-complete button works is because combat itself is automatic. When your character starts a battle, there isn’t a whole lot of input required from you. You pick the skills that you want your character to use, but the game is the one that activates those abilities in a rotation. Sometimes, once you’ve accrued enough power, you’ll use your servant’s (i.e. your pet’s) ability. You can also switch targets manually but, in general, the game does a good job of selecting which enemy to attack next. In other words, if you’re the kind of person that likes direct control, you’ll be sorely disappointed. However, you have control over how powerful your character can be. The game wants you to be more like a coach to your character and party members. Much of your party’s success rides on their individual members’ power rating, a number that goes up based on the equipment you wear, how much you’ve enhanced it, and, of course, your level. If you set up your party correctly, then it’s smooth sailing – just click on the appropriate auto button in the Task Tracker or dungeon interface and you’re free to do whatever else you want with your life. If you aren’t strong enough, well, good luck trying to figure things out with that messy UI and poor help system. There are a few other things that may annoy you. The English localization is kind of bad, though you may find the weird syntax and okay grammar cute if you’re into ironic humor. That translation doesn’t help the story much either, which is forgettable and nonsensical in spots. The cash shop isn’t very intrusive, but it does feature a service that will let you grind out monsters while you sleep – which is basically game-sanctioned botting. Divines of the East is a lot like a beautiful date with deep seated issues. On one hand, the game is fun to look at and is quite easy going at first. You may even find yourself having some dumb fun with the game. But, when you try to get to know the game better you’re liable to drive yourself nuts as you deal with the messy complexity of its interface and gameplay mechanics. Some people may be attracted to that kind of mess. Heck, they may even find the challenge rewarding. However, those who are looking for less hassle with their games should probably stay away. NGames would like to announce that Pixel Hero will have its first Closed Beta Test on June 5th!